Rallying, one of the most wild and exciting forms of motorsport, is rapidly gaining its league of enthusiasts in India. This was evident at the 2016 edition of the Maruti Suzuki Desert Storm when over 200 motorsport fanatics turned up, the highest ever for the rally that is now in its 14th edition. Spanning four categories, the racers, from veterans to first-timers to international professionals, were flagged off with fanfare from the Great India Place Mall in Noida on Sunday afternoon, 3rd April. From Noida, the rally will head for the sand dunes and rocky terrains of Hanumanagarh, Bikaner, Jaisalmer and Jaipur in Rajasthan. The last leg of the rally will conclude in the sandy expanse of Jodhpur on April 10th with a prize distribution ceremony. Throughout, the course of the rally the racers, hailing from various cities across India like Jaipur, Mumbai, Delhi, Gurgaon, Chandigarh and Bangalore, will cover a course of 2,000 kilometres in total. The six-day rally is being held in four categories - XTreme, NDure, XPlore & Moto. With an aim to make the rallies even more exciting and fun, this year’s event will follow flexi-route format in the Xplore category (Delhi to Jaisalmer (Xplore Dawn) and from Jaisalmer to Jodhpur (Xplore Dusk). Both these legs will run for 3 days and will run independent of each other. The objective of such a format is to provide short length rally exposure and encourage bigger participation. A night leg of the rally covering 200 kms is planned for the second day in the Bikaner to Jaisalmer section to enhance excitement for the participants as well as the spectators and the media. Some of the most prominent participants this time round include Suresh Rana, Sandeep Sharma, C S Santosh and Karthick Maruthi. Bani Yadav and her navigator, Sukhbans Mann, past 3-time winners of Desert Storm, will be one of the 6 women teams participating in the rally this year. 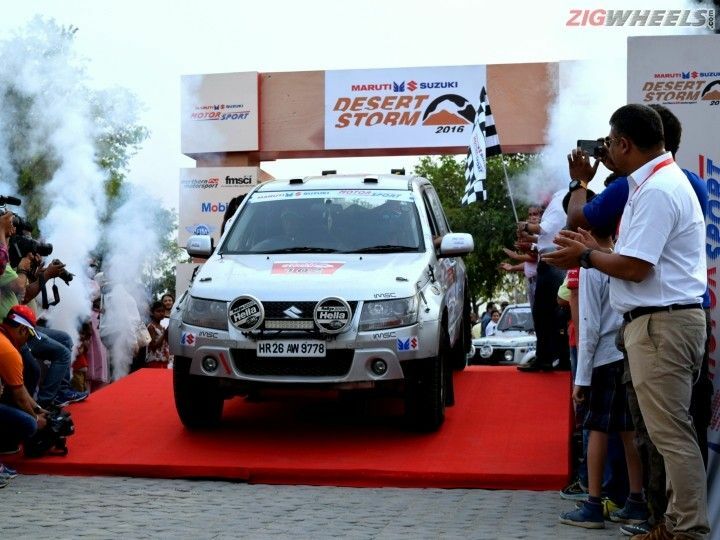 Winner of Desert Storm 2010 and 2015, Aabhishek Mishra, from Jaipur will be seen driving the Maruti Suzuki Vitara and Karthick Maruthi will be driving the new Vitara Brezza. This marks the debut of Maruti Suzuki’s Vitara Brezza in motorsport circles. Below is the schedule for the 14th edition of Maruti Suzuki Desert Storm. Hanumangarh to Bikaner with two competitive sections enroute. Toughest day of the rally. 187 kms of competition distance. Rally starts in the wee morning hours at Jaisalmer.